When instructors work to improve their student's sentence structuring skills, one useful idea is to have students practice grammar, identify objects, and understand how objects function effectively within the English language. Objects are a necessary grammatical component for students to understand if they are to develop proficiency in constructing meaning at the sentence level. Objects are a part of the sentence predicate, so they could be incorporated into lessons that deal with this sentence component. The following sections will provide examples of the types of objects used in English and how they function in sentences. The examples could be extracted from this article and used to create worksheets to introduce the concept of the object, to reinforce and practice the concept, and quiz students on their level of comprehension at the end of the lesson. While all three perform somewhat related jobs in sentences, there are distinct differences in both position and function that students need to be made aware of if they are to master effective sentence construction. Of the three main types of objects, the first one that students typically learn to identify is the direct object. Direct objects receive the action of the verb (specifically, the transitive verb) in the sentence. The subject of the sentence does something directly to the direct object (hence the name direct object). The young man threw the rock. Thomas Jefferson signed the Declaration of Independence. Richard Wright wrote Native Son. In terms of function, whatever the subject of the above sentence does (threw, kicked, signed, wrote, and invented) it does to the direct object (the rock, the ball, the Declaration of Independence, Native Son, and the light bulb). In terms of position in the sentence, the direct object is typically placed directly after the transitive verb unless the sentence contains an indirect object. 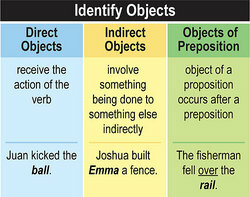 Indirect objects are included in sentences when the subject of the sentence does something to something or someone else. Not all action verbs can take an indirect object. Again, like the name suggests, indirect objects involve something being done to something else indirectly. I gave my girlfriend a rose. Lisa told her niece a story. Bruce sang a ballad to his countrymen. Christian bought Elizabeth a watch. Joshua built Emma a fence. Notice that, in terms of position, the indirect object comes between the direct object and the action verb in the above sentences. In terms of function, if the indirect objects were removed, the sentences would still make sense. However, the reader wouldn't know who or what the action was intended for. Objects of prepositions are often confused with direct objects because they also receive the action of the subject. However, the crucial difference is that the object of a proposition occurs after a preposition. We talked about the war. Virginia swam across the bay. The fisherman fell over the rail. The dog rested by the fireplace. Tim played in the street. The objects of the prepositions above receive the action of the subject in the sentences, yet they need a preposition for the sentence to make sense. For example, We talked the war is ungrammatical. For students to correctly identify this type of object, they will need to be able to identify prepositions. When students practice grammar, identify objects, and understand how they function within sentences, the process is often slow. Objects are the first nouns that students work with in the predicate of the sentence, so they are more complicated than the subject nouns students typically learn to identify first. Start with simple transitive verbs and clear direct objects before moving into the more complicated indirect objects and objects of prepositions. For the latter, a lesson in prepositions will need to precede a lesson in objects of prepositions if students are to be expected to identify this particular object. "Grammar Lesson to Identify Objects." YourDictionary, n.d. Web. 24 April 2019. <https://education.yourdictionary.com/for-teachers/Grammar-Identify-Objects.html>.